One of the most difficult jobs of effective transportation planning, is the compromise between creating good environments for active transportation and transit while at the same time taking into considerations the need of freight carriers such as trucks that provide an important economic tool for many communities. A great example of the problem areas for this compromise is in industrial areas. Industrial areas see a large amount of freight traffic (hopefully both on rail along with trucks) but you also need workers in industrial areas but they can be extremely difficult to serve with transit. Many transit advocates don't see the need for industrial areas and would love them to just go away. The problem with this line of thinking is that industrial areas tend to be the best sources of jobs that can lift people out of poverty. They provide a good paying jobs that do not require a college education. The question is how do you serve industrial areas with transit and consider the last mile problem? One of the problems with transit service in these areas is that most of the ridership occurs only during shift changes which means if the industrial area is the primary point of travel for a transit line, it will only be busy during certain times of the day and run empty the rest of the time. There is a couple of solution to this problem. One is to ensure that the industrial area is not the primary destination of the transit route. For example TriMet route 16 in Portland travels through the Northwest Industrial District but also serves downtown, the St. Johns area, Linnton and Sauvie Island. Two other routes the 15 and the 77 do terminate in the area but they are long routs and the industrial district makes up only a small portion of their total route mileage. A second solution is to provide a shuttle service to the industrial area from a major transit stop. Companies such as Intel and Nike provide shuttle services from MAX light rail stations in Portland to their transit unfriendly campuses. Another example is the Burbank, CA Metrolink Commuter Rail station that sees a large number of company vans providing service from the train station to their offices although in this case they are not in industrial unfriendly industrial areas. In the cases cited the service is only provided by a specific company for their employees. A third example is in the Chicago Suburbs were employers pay the PACE transit agency to provide shuttle service from train stations to their businesses and these can be used by anyone willing to pay the fare. Another problem presented by industrial areas is access by active transportation such as walking and bicycling. 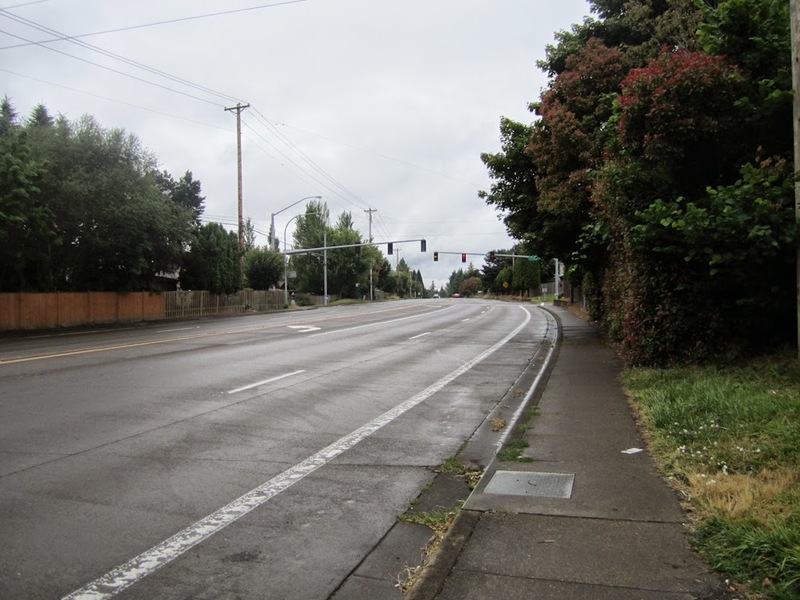 While few people will probably walk all the way to the industrial area from their homes, they may have to walk a distance from the bus stop to their place of employment and many times there is few if any sidewalks. A bigger problem is the conflict between trucks and bicyclist. Industrial areas can be congested with truck traffic that makes it dangerous for bicyclists. Trucks are large and have a hard time seeing cyclist in their mirrors. The best solution in this case is to provide dedicated infrastructure for bicyclists so they are separated from the trucks but not may not always be possible. When bicyclists and trucks do have to share the road one of the most dangerous times is when a truck is making a turn because once the cab of the truck is at an angle it is very difficult for the driver to see what is on his right side. While there is no fail safe solution to this the problem, there is some relatively inexpensive things that can be done to increase safety. One would be to install mirrors along driveways giving truck drivers an additional way to see in their blind spots and the other would be put up more signage warning bicyclist and trucks of the dangers. A final idea would be an educational campaign that would teach both truckers and cyclists how to be safer around each other. The problem here is reaching the large number of long distance truck drivers who may come into the area only occasionally. Industrial zones are important part of our economy but create unique transportation challenges especially when trying to serve them with transit and adding active transportation. It can be done but it takes cooperation from all parties to make a system that works. A couple of months ago a major anniversary took place that I let pass by without any fanfare mainly because how busy I have been over the summer and continue to be. The anniversary that took place on August 4th when this blog turned 10 years old. Back then it was called Transit in Utah and was started to discuss transit issues in the Salt Lake region and other parts of Utah. Having been a transit and rail passenger advocate for many years, it was an opportunity to discuss some of the things I have learned over the years and saw as opportunities to improve transit service. As the blog matured I became interested in how land use and transportation have interacted over the years and how we have ended up with the land use patterns we have today. I have also become very interested in Urban Design and how our built environment works and doesn't work. It only took a short time for this blog to start focusing on issues outside of Utah considering I have plenty of transit experience outside the region having grew up in Pasadena, CA and having lived in Spokane, Seattle, and Charlotte over the years. However, it took until 2011 when I moved to Portland to officially change the name of the blog to something that more reflected what this blog is about. Sadly over the last few months I have not been able to post as frequently that I would like and cannot see that changing before next June at the earliest. I have plenty of ideas for stories and will try to post when time allows. Thank you for reading over the years and I hope you will stay tuned for the articles to come. What makes a Successful Public Space? What makes a good public space? One that people want to use and is used by a large number of different people? The Project for Public Spaces is a good source for information about what a successful public space should have, today I am going to look at two public spaces in the city of Portland Pettygrove City Park and Pioneer Courthouse Square. The latter one is known as Portland's "living room" while the other languishes despite being close to office buildings and residences. Can Alternatives to Owing a car be made More Convenient? Are you like me and have a large number of the chain store loyalty cards attached to your key ring that your rarely if ever use? One of the reasons that the stores use these cards is that their marketing people tell them that a customer that if a person has a loyalty card they will more likely shop at that store when they have a choice. The problem is you get so many of these cards and many of them are nothing but a program to get access to your information so they can target even more advertising your way. There is not a benefit for you as a consumer to have these cards unless you actually get something for your effort. 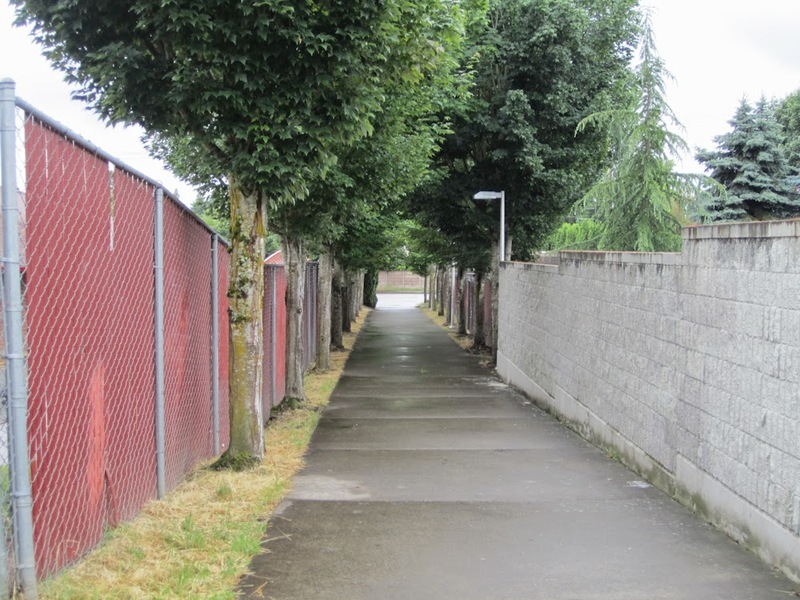 Is it the Pathway or is it the Urban Fabric? 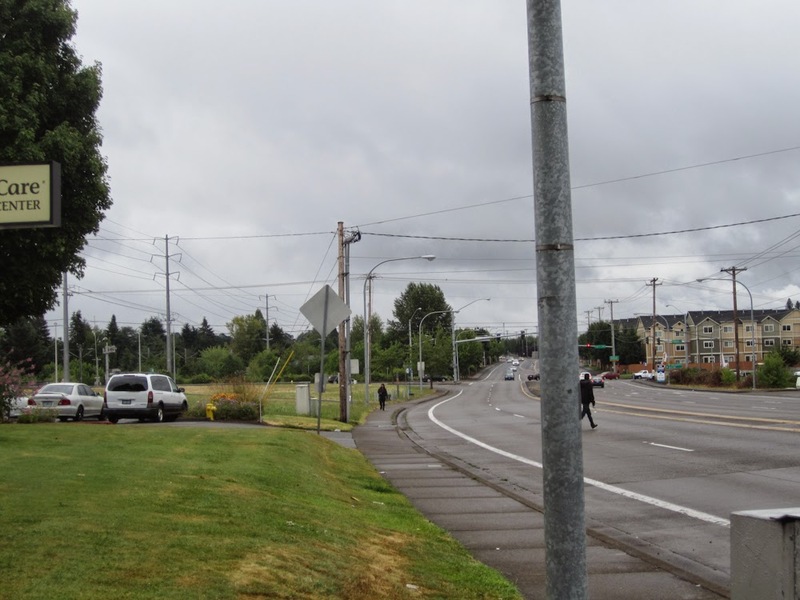 TriMet is looking at closing a pathway that connects the Willow Creek Transit Center which is located just northwest of the intersection of 185th and Baseline on the MAX Blue Line. The reason behind the possible closure is because of crime and drug problems along the path so I decided to take a look at the situation first hand to see what the problems truly are here. The pathway in question goes south from the transit center to Baseline Road. The picture above is looking from the Willow Creek Transit Center toward Baseline Road and instantly you can see two major problems with this pathway. The first is that there is high walls on both sides blocking views of anyone along the path and the second is that there is very little lighting along the path. In addition there is a child care facility to the left of the photo which is only open at certain times of the day and there is a single family residence located to the right of the photo. The next picture is looking back toward the transit center from Baseline and once again you can see the problems along the path. Once again you have the fences which creates a canyon affect which is just asking for problems in addition to the bushes on the right that even further block the view of the path. 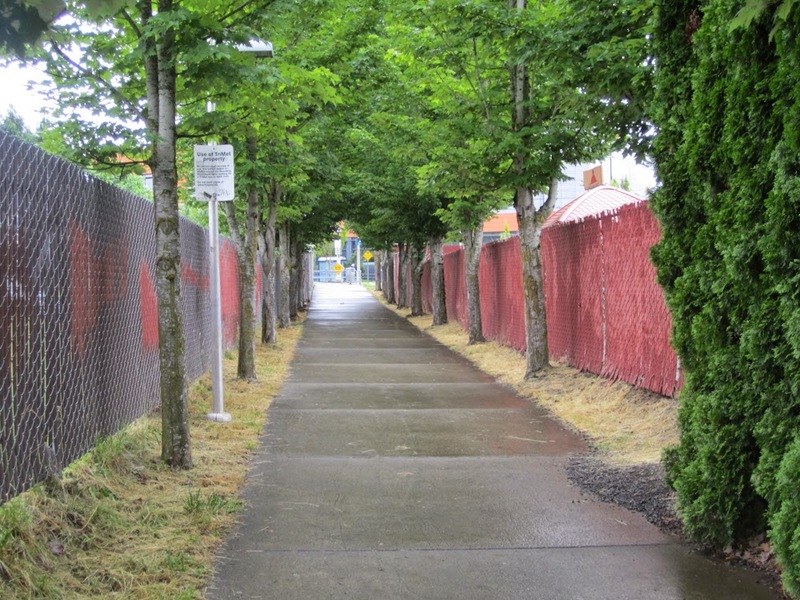 While you want tree canopy to shade pathways and make them more walk-able in this case they combine with the high fences to further hide the pathway from the public. Once you get off the pathway you have more issues once you get to Baseline. The road is wide with narrow sidewalks and very few streetlights. As can be seen in the upper photo looking toward the west where most of the residences are you have fences that put even fewer eyes on the street. Looking east you have a child care place that is very auto centric and turns its back to the transit center then empty lot on one side of the street and a shopping center. The problem with closing the path is that for people to residences located on either side of Baseline there it leaves a long walk. From the transit center you will have to travel out of your way and head north to Edgeway then head to 185th then south to Baseline with both of those streets being very pedestrian unfriendly. While walking is fine for many of us, we also have to take into consideration the elderly and those with limited mobility that will have a more difficult time reaching the center. The other alternative for these people will be to take the infrequent 88 bus that travels a short distance on Baseline to reach the transit center. The problem here is not the presence of the pathway but the Urban Environment around the pathway or the lack there of. The pathway design creates a canyon and walled off effect that means that there is not eyes on the pathway. The solution is not to close the path but to find ways to make it safer which will require rethinking how it is laid out and the visibility onto it. Unfortunately it is just not the path that is the problem, the area around Baseline is auto-centric suburbia where pedestrians come last. Hopefully a good solution can be found. Some of you may remember when I mentioned I graduated from Portland State University with a Bachelor's Degree. Well I immediately started the Masters of Urban and Regional Planning program in September with a specialization in Transportation plus an Urban Design Certificate. Well now I need to do 400 hours of internship hours to graduate so I am currently looking for one. You would think that I would have enough experience (especially after writing this blog for 10 years!) plus my business related background but as an older student sometimes it is difficult to find the right position. Therefore I am checking with my readers to see if they have any leads on internships. If you have any possible leads let me know at jdornoff(at)pdx.edu. Thank you and I will be written more in depth articles soon.